Those of you who follow me on instagram know that you are looking at the latest episode of This Week in Pizza, featuring Brussels sprouts and bacon. It was a riff on a pie we order all the time at one of our favorite local haunts, and yes, it was delicious and easy and fast and bla bla bla, but that is not the whole story this time. If you pulled back to see outside the frame of this shot, you’d see a chicken breast browning in a skillet, a second dinner, all for Phoebe. This has been the MO in our kitchen ever since she came home a few weeks ago telling me that her classmate had done a little research and uncovered something fascinating, if maybe slightly suspect: The best performing athletes, she said, are on this caveman diet called Paleo. Have you heard of it? I replied with one of my favorite father-in-law expressions: Um, I didn’t just fall off the turnip truck yesterday. So when she told me she wanted to go Paleo, my initial reaction was suspicion. Especially since she is 16 and still hasn’t gotten over her egg aversion, and as far as I can tell eggs seem to make up 90% of Paleo recipes out there. But she promised that the special prepping and cooking wouldn’t all fall on me — she’d be responsible for shopping lists, researching dinner recipes, making her own meals if what I was cooking didn’t work for her. She promised me she wouldn’t be too obsessive about it — if, say, some soy sauce slipped into the drumsticks marinade she would still eat them — so I agreed. It’s not breaking news to say that raising teenagers is hard, but I need to remind myself that I am now in the stage of parenting where it’s pretty cool that my kids can watch Curb Your Enthusiasm with me and show me how to apply foundation using a beauty blender, and introduce me to bands named The Swmers, and remind me when the latest John Green book is out, and drag me to random dessert festivals in Queens that in a million years I wouldn’t go to on my own but end up being kind of anthropologically fascinating. So cooking Paleo is the latest entry on that list, and perhaps not surprisingly I’ve gotten kind of into it. Our fruit and vegetable supply has never been more robust, it’s forced me to explore new techniques and ingredients (‘sup nutritional yeast?!) and paleo-izing dinner usually just means subtracting the quinoa or withholding the croutons from the kale salad. And even though she is the only one sticking to the plan, often I find myself recreating her snacks and meals for myself — lettuce wraps with roast beef, avocado, and avocado mayo; BLT salad with chicken and avocado; baked sweet potato with tahini dressing; apples and almond butter; nori wraps with turkey and avocado; strawberry-almond milk smoothies; spaghetti squash with mushroom “bolognese;” a big green salad alongside…wait for it…a fried egg. (Yesss!!!) And the other night, while this Brussels sprouts pizza was baking, I browned a few thin chicken cutlets in some bacon fat for her, added some of the Brussels sprouts and chicken broth and ended up making extra for myself. 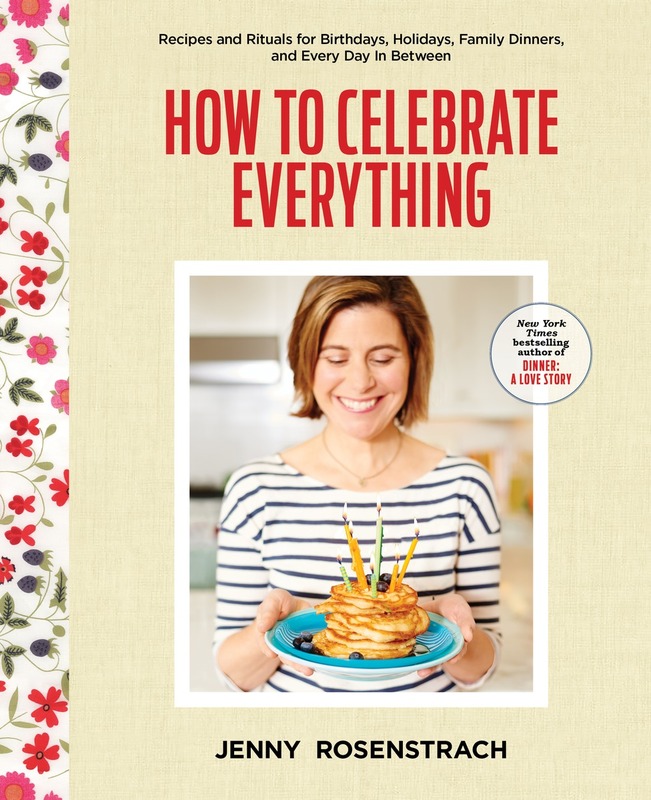 I’m guessing that by the next blog post this will all be a distant memory (except the egg-eating; praying that one sticks) but until then, I’m going with it and most likely posting recipes that work for all the diners around the table without modifications. It’s sort of like cooking for toddlers again. Let me know if you have any advice or recipes. Place pizza dough in the center of a lightly-oiled rimmed cookie sheet. Using your fingers, stretch out the dough to the sides of the pan. The goal is to get the crusts as thin as possible. Brush dough with about a tablespoon of olive oil that’s been spiked with a little garlic powder. Top with mozzarella, leaving a one-inch rim around perimeter. In a large bowl, toss the Brussels sprouts and shallot in remaining olive oil. Add salt and pepper and toss again. Spread on top of mozzarella. Bake for about 12-15 minutes until crust looks golden and Brussels look cooked (it’s ok if they are slightly burnt). While pizza bakes, add bacon to a large skillet set over medium heat. Fry until crisp, remove to a paper towel to drain. * Chop into small pieces and sprinkle on top of pizza along with Parm. *At this point, I browned one boneless chicken breast (cut horizontally into two thin pieces) in the bacon fat, removed them, tossed another handful of Brussels sprouts and shallots in the pan, then placed chicken back in with a little homemade chicken broth. Simmered another 5-7 minutes until chicken was cooked through, then topped with bacon crumbles. I wholeheartedly agree with your approach to supporting a healthy outlook on food and body image, and it sounds like you’re all doing great! So I hesitate to chime in with some conflicting data, because I don’t want it to seem critical of either of you. But I think your daughter may not have all of the information she needs. Teens are still growing and – very importantly – their brains are still developing. So they need a lot of glucose, which is the body’s main fuel and is critically important for developing brains. Our bodies get glucose from carbohydrates, and athletic teens need up to 70% of their calories to come from carbs. Teens also need more daily calories than at any other time in their lives. So the problem with paleo for a teen (especially a teen athlete) isn’t that carbs from vegetables, whole fruits, and dairy aren’t perfectly fine, it’s that those foods are so filling that it’s hard to eat enough of them. (This is why paleo can be a great choice for adults who are done growing and need fewer carbs and calories overall.) So, if she finds that her energy levels start to flag and she starts feeling a little less mentally sharp, she should not be afraid of adding some complex carbs back into her diet. As a Registered Dietitian, I have to say thank you for spending “an enormous amount of psychic energy emphasizing health over weight, strong over skinny.” As you noted, diets/trends come and go, but a healthy self-image and relationship with food as fuel/nourishment for our bodies is a powerful, lasting thing! My favorite Paleo breakfast is something I discovered when doing a Whole30, but was one of those recipes that turned out to be just awesome, and is now one of my husband’s most requested meals. Bonus for Phoebe–it’s eggless. Saute a pound of ground turkey or pork, set aside. While the meat is browning, cut up a sweet potato, red bell pepper, half a red onion, and an apple in a small dice. Saute in the fat of the meat until all are tender (I start with the sweet potatoes, then add the bell pepper and onion, and finish with the apple, to correspond with varying cooking times). Season with fennel seed, garlic powder, black pepper, red pepper flake, and cinnamon. It’s DELISH. I wonder if she would like pizza chicken? Pound a chicken breast (or slice lengthwise), dredge in egg & then breadcrumbs, and bake until almost cooked through. Take it out oven the oven and top with some pizza sauce, your desired toppings (bacon is great), then mozzarella cheese. Throw back in the oven for the last 10 minutes. It gives you that pizza flavour without the flour! That sounds like the best thing I’ve ever heard for the rest of my family — unfortunately both breadcrumbs and mozzarella are paleo no-gos. Thanks for the idea! I don’t love eggs, but I do love me some Paleo!!! I am interested to hear how a teenage athlete benefits from eating this way as far as her training goes. I know some long distance runners swear by veganism but I do not see how I could ever consume enough plant-based protein with the calorie burn required for that level of physical activity. You may like a lot of Michelle Tam’s recipes, she blogs at Nom Nom Paleo and has a recipe app for the ipad. I also love Primal Palate (blog and Paleo spices), The Castaway Kitchen (keto Paleo), NoCrumbsLeft is great too for ALL kinds of recipes. I am new to Nom Nom Paleo, but so far I love what I see. I bought her first book almost immediately and made Phoebe dog-ear recipes she liked. We love Nom Nom’s Magic Mushroom Powder as seasoning for roasted potatoes, veg, chicken, etc. Definitely gives them a little something extra! My diet is the opposite of Paleo (Futuristic? ), BUT I am obsessed with the paleo granola in the bulk section at Whole Foods. It’s crazy good! Parenting teenagers is SO hard. I think one of the reasons is because it’s hard to talk about them/write about them without having to be mindful of their privacy and own sense of self. So different from writing about/talking about toddlers and preschoolers. I’ve been following you since the beginning (which means in my mind we are BEST FRIENDS not-in-a-stalker-way), and I know you’ll strike the balance just right with this. I have a teenage athlete (boy) as well, and he really struggles to get enough calories in. It’s hard to navigate some of those conversations without the inevitable focus on weight. He was really too skinny at one point this winter and not for lack of trying to eat. And I found it hard to balance getting enough calories in him with maintaining healthy habits. 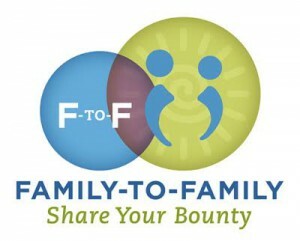 AND then hard to find resources on the issue, or a place to talk about it. Nom Nom Paleo’s spicy tuna cakes are one of my favorite foods ever! So good! I take no diet program at present but I want to be more healthy and stronger. Thank you for sharing the post and the great recipe! Pizza with Brussels Sprouts & Bacon looks a good recipe I will make my family make it. Jenny – question? Where did you get the flour, sugar canisters in your picture? Love them! I bought them at an antique fair in Philadelphia probably 20 years ago. I’ll bet if you search Art Deco/Mid Century canisters on eBay they will come up from time to time. I like NNP as well, and have made some good recipes from Melissa Joulwan’s Well Fed books/blog. If you use a pressure cooker, many of the NNP instant pot recipes are fantastic! We are not paleo, however — there is too much good wine, bread, pasta and ice cream out there! 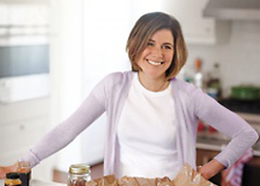 So, we pick and choose, but generally like the focus of paleo recipes on whole ingredients. 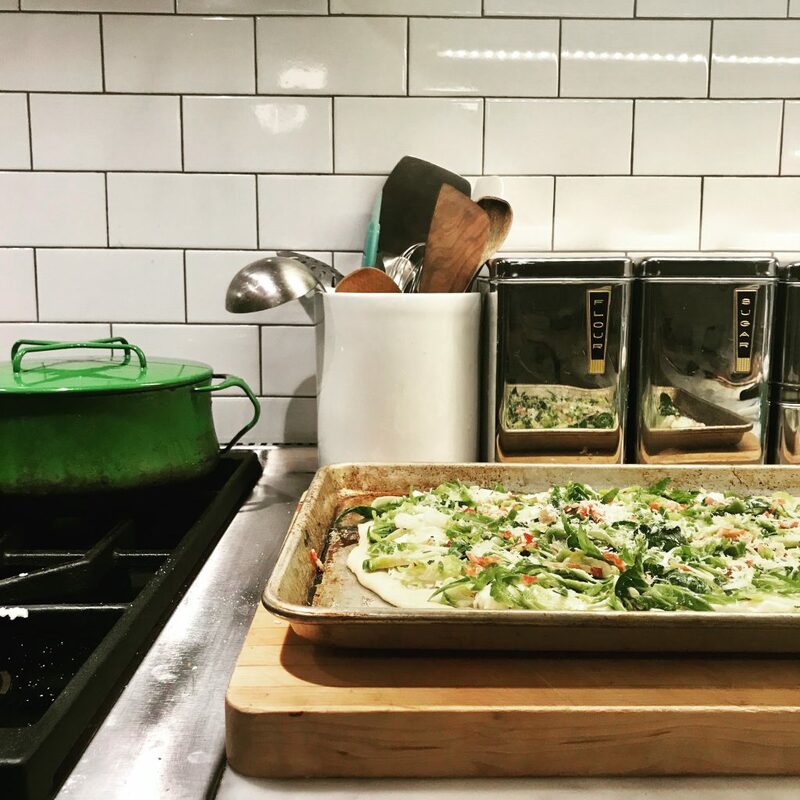 By the way, Melissa Clark has a fantastic recipe for a pasta with Brussels sprouts, pancetta, and jalapenos that looks a lot like your pizza! Great combo. 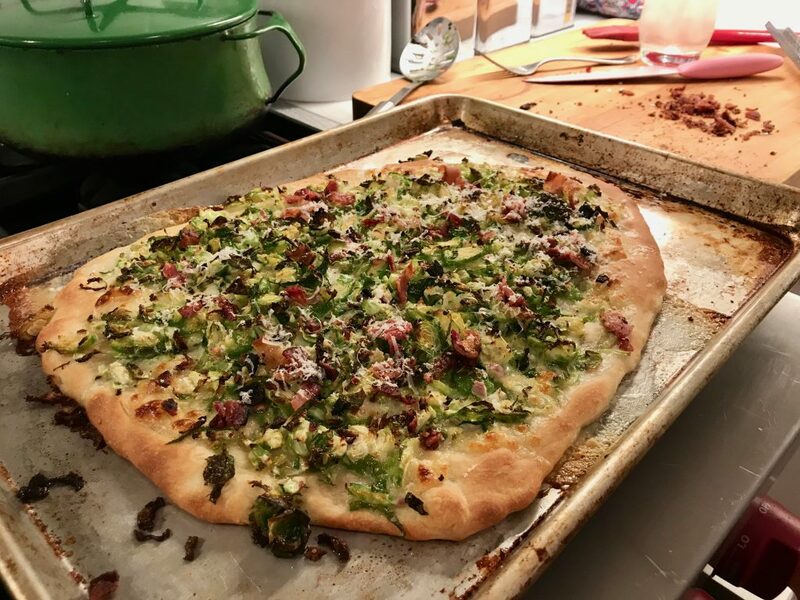 This recipe combines four of my daughter’s favorite things: pizza, Brussels sprouts, Parmesan, and bacon. A wonderful family dinner targeted to her (while her brother’s on an overnight field trip). Thanks for a great recipe and all your thoughtful posts! Jenny – just made this tonight to use up some bacon in the fridge and it was SO GOOD! The shallots add so much. And of course, used Jim Lahey’s pizza dough. Thank you!! !